Being a celebrity is not always what you think it’s cracked up to be. Think about a normal job, once the employer has given the job to that person, it’s their for the foreseeable future. Celebrities often have to battle their way into whatever job they get on the other hand. And there is always an element of too much or too fast going on, which often tends to bring a lifestyle of partying to kids who are too young to really know what that is. Hollywood’s managed to snug out some bright flames in many young stars. At first, things look good for them, everyone believes they’ll go a long way into the future with their careers and they’re highly talented, but they fall of the charts somewhere along the way and their 15 minutes of fame is now over. The problems with child stars that fall into this category is that once they’ve gotten a taste for the fame and fortune Hollywood can bring into their lives, they often don’t want to give it up. They were famous once and loved it, so they’ll pretend they still are until they’re famous once again. It may just be best to move onto another career path or have a nice, quiet life with the millions they’ve went and made in the past. But some child stars simply don’t know when they should just call it a day. In some ways they may still believe they’re famous, and they are, but only for their past ventures and possibly a few current antics that keep them clawing to get back into the game. Here are 15 former child stars who still think they’re famous in Hollywood. 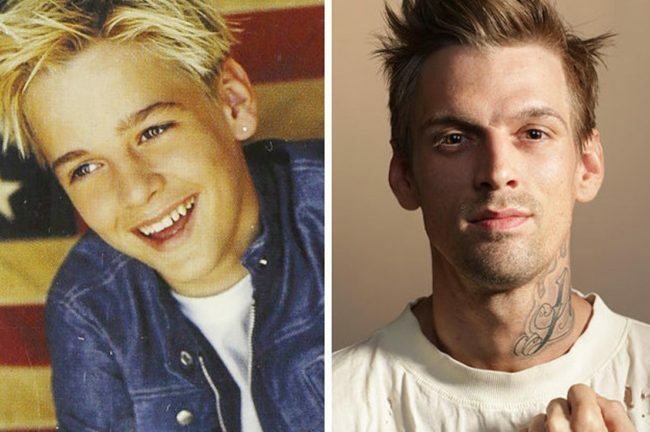 When Aaron Carter came onto the scene at age 9, opening for his brother’s group, The Backstreet Boys, there was no one more adorable than him. His biggest hit song during that time was “I Want Candy,” and who doesn’t love a kid who sings about candy? As his fans continued to grow, so did he, his musical tastes began to evolve and he didn’t release much for 14 years. Fans more than likely believed he moved on with his life, but recently he came out with a 5-song EP, which, according to Fox News, sheds some light on the personal struggles he’s went through in his life. In the meantime, his personal life has really been quite a mess, with possession busts that landed him in rehab as well as a DUI. He’s also struggled with an eating disorder. While he’s trying to forge a comeback, things seem to be stalling out for him as he’s beginning to realize he’s been out of the game for so long that even his fans have forgotten.